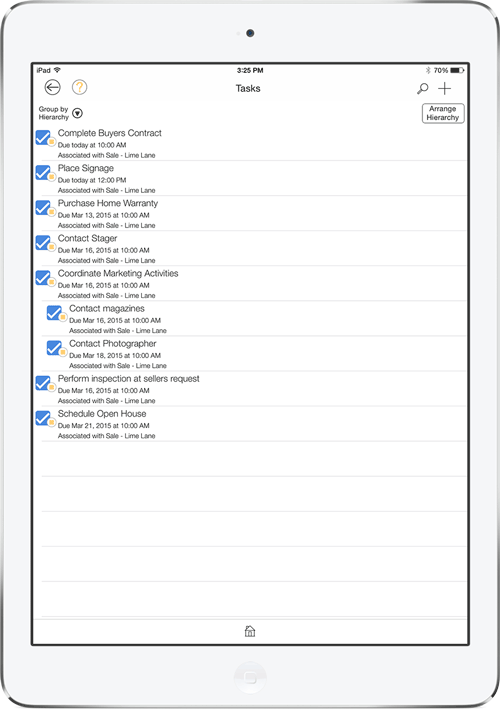 LifeTopix is an all-in-one productivity app for iPad and iPhone. 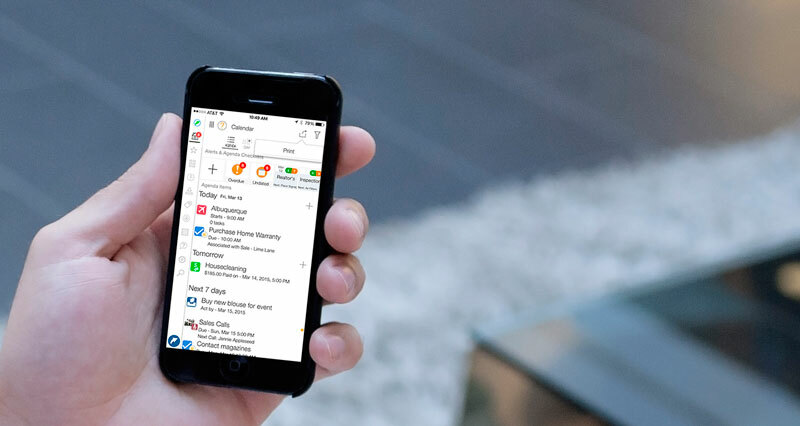 We have many customers who follow David Allen’s Getting Things Done® (GTD) method and use LifeTopix to stay organized and productive. Many of these customers ask about the most efficient ways to use LifeTopix for GTD® and our best practices. David Allen rewrote the “Getting Things Done” book for 2015 and beyond, which was originally published in 2001. In addition, LifeTopix has evolved since we first published the popular post, “Best Practices for Getting Things Done – Master Organizing” in 2013. We strive to keep our customers up-to-date and hope you enjoy the new information we’re providing for you today. The video below discusses the “Organizing” phase. When you organize actions and reference material, think about how you would sort these items into various areas. In an earlier post, we discussed using LifeTopix to define each collected item as actionable or non-actionable. Once you’ve completed clarifying items, you can begin organizing them (or this may be done simultaneously in LifeTopix). In the next few weeks, we’ll be posting more videos and tips to assist you with utilizing LifeTopix for GTD. Please subscribe to the Life Blog to stay up-to-date. Do you need an easy way to track things, such as all your personal and business belongings? What would happen if you encountered an earthquake, flood, fire or break-in? Would you have a complete report of your assets for your insurance company? Nobody wants to think about these possible tragedies, but it’s best to be safe and prepare for the unthinkable. This is where LifeTopix for iPhone and iPad can help. 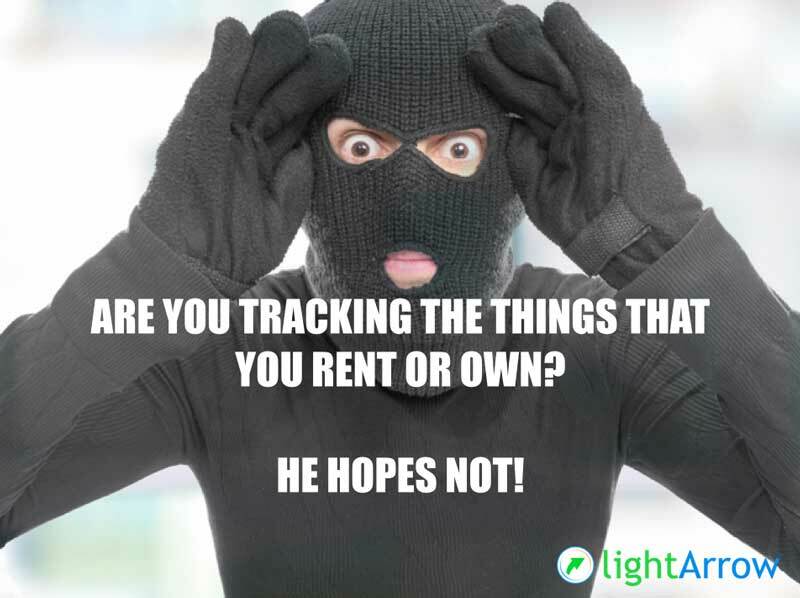 LifeTopix provides an effortless way to track and catalogue the things that you rent and own. Watch the following video to learn how. If you’re not familiar with LifeTopix, it’s an all-in-one productivity app for business and life available at the Apple App Store. With LifeTopix, you can organize and plan just about anything in your busy life. You can manage projects and tasks, make to do lists, take notes, manage files, make grocery lists, track finances, plan services, manage contacts, track assets, create events, plan travel, manage education, track health and much more. One of the unique aspects of LifeTopix, is the ability to print agendas, to do lists, checklists, tasks, asset reports, notes, grocery lists and more. Today’s post shows you how to get the most out of the printing features of your LifeTopix app. Knowing what’s on your schedule today, tomorrow and the next seven days is key to getting things done on time. 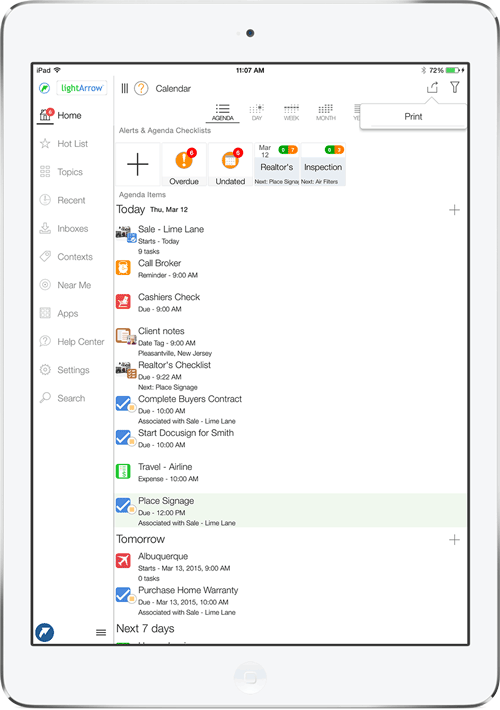 That’s why LifeTopix includes a unified agenda with your to do lists or checklists, reminders (LifeTopix and iOS) and calendar items (LifeTopix and iOS) all in one easy-to-read view as shown below. You can easily print your agenda by tapping the icon that’s indicated in the above graphic in the upper right corner. After you choose “Print,” you can choose whether you want to print in Portrait or Landscape mode. Next, LifeTopix asks if you wish to save the Agenda to the My Documents folder. When you save the file to My Documents, it becomes available for use as a PDF. You can now associate this file with many items in your LifeTopix app, such as projects, tasks, contacts and more. An example of a printable agenda is shown below. Tapping the icon in the upper-right corner in the screen above allows you to share, print or open the document in a different app. 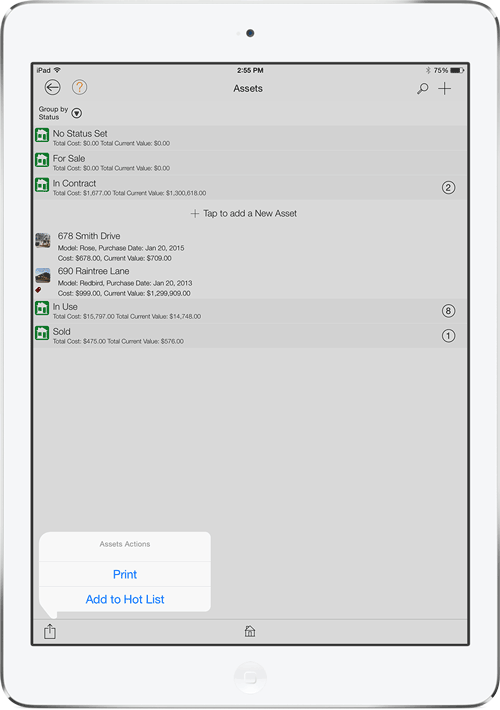 One of the unique features of LifeTopix is the ability to keep a list of assets that you own or lease. In fact, you can use LifeTopix’s asset features in a variety of ways. 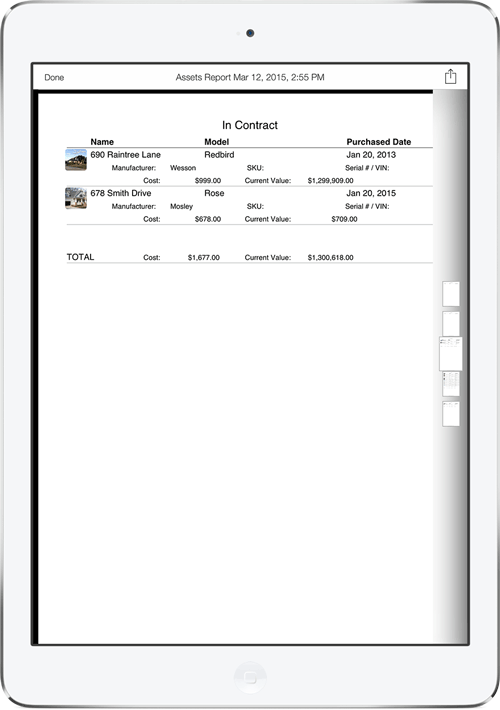 For example, real estate agents use assets to track home selling details for their clients. In LifeTopix, assets hold a variety of information. For example, an asset may include manufacturer, model, SKUs, serial number or VINs as well as other information. Assets also include categories, purchase dates, last updated dates, statuses and optional context tags; in addition, assets can be sorted, organized and printed by these categories. 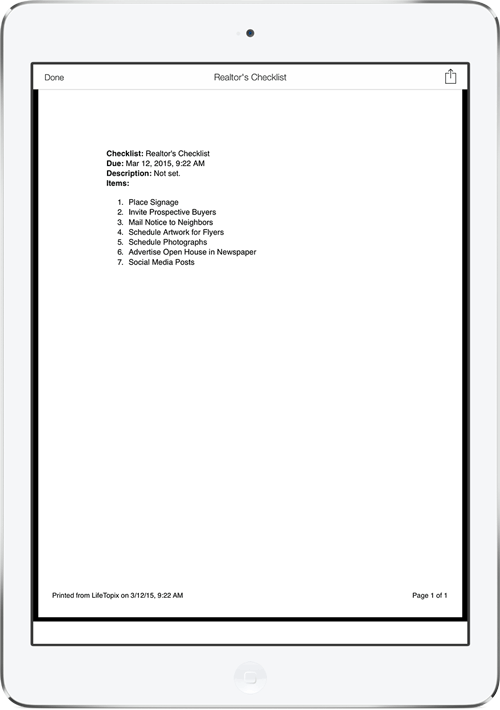 The images below show an ungrouped and grouped list of assets in the LifeTopix iPad app. The grouped assets are organized by category, which in this example is “For Sale,” “In Contract,” and “Sold” for a real estate agent’s properties. These statuses are flexible and defined by you. 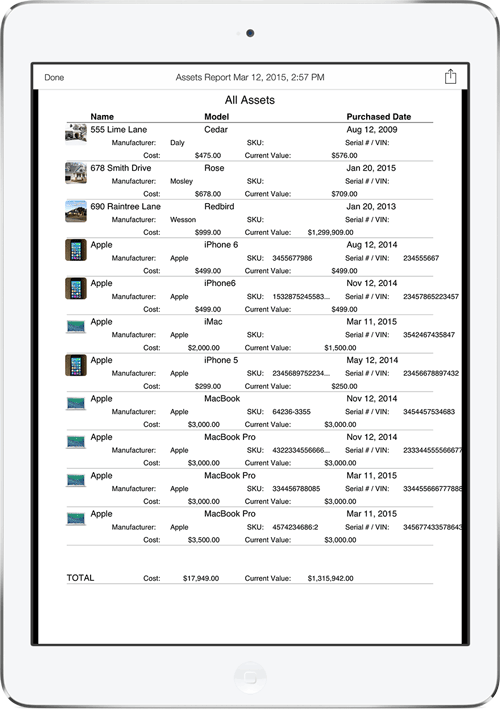 Once you display these assets, you can generate an asset report in portrait or landscape mode by tapping the icon at the bottom left and choosing Print as shown above. 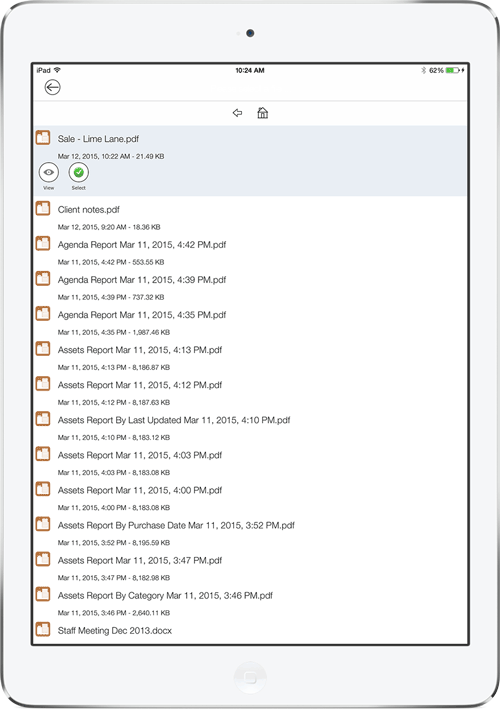 Just like the Agenda view, you can choose to save the report to your my Documents folder or go directly to the print button to print the asset report, open it or share it. Examples of the uncategorized and categorized reports are shown below. 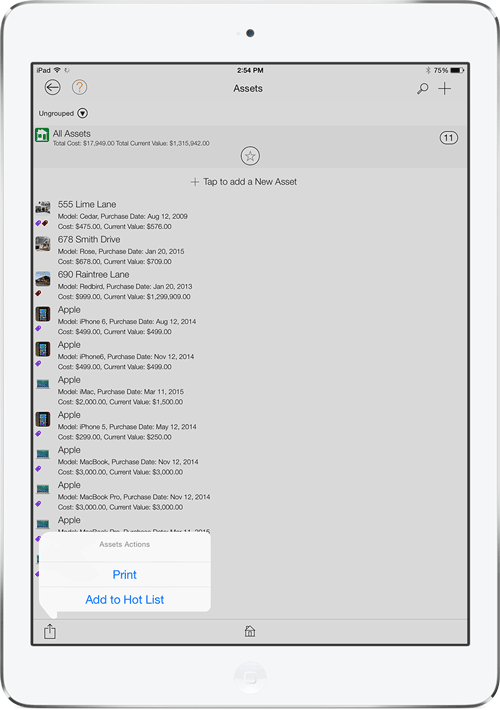 One of the most valued features of a to do list app is the ability to print the list, but this feature is not always available from the single purpose apps that you find at the Apple App Store. 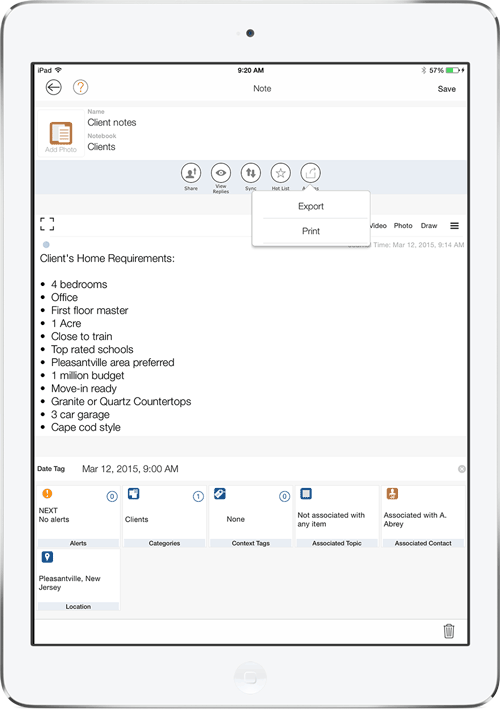 LifeTopix includes wide-ranging checklist and to do list capabilities in the Notes + Files, Lists topic. 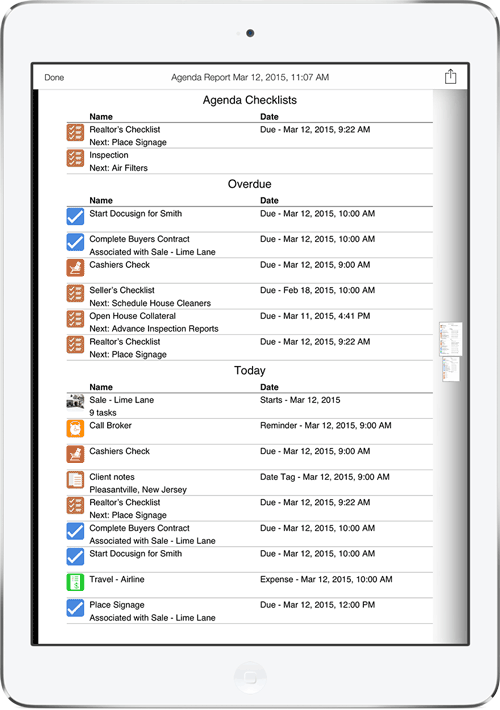 You can prioritize, print, re-use, add due dates, copy, and export your to do lists and checklists. In addition, you can convert these lists to “Pro Checklists” in order to add tasks, appointments, reminders, activities, nutrition, health stats, medication and wellness entries to a list. 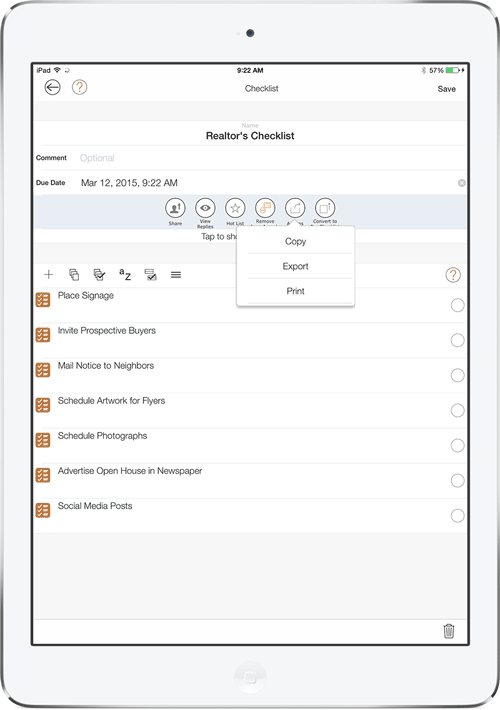 An example of a LifeTopix checklist for a real estate agent is shown below. Printing a to do list is simple. Tapping Actions -> Print as shown above displays the checklist and gives you the choice of saving it as a PDF if you wish. An example of the printed checklist is shown below. Tapping the icon in the upper-right corner in the screen above allows you to share, print or open the to do list in a different app. The LifeTopix Tasks + Projects gives you the ability to organize, enter, prioritize, track and check off even the most complex projects and tasks in a natural, streamlined and easy-to-understand way. 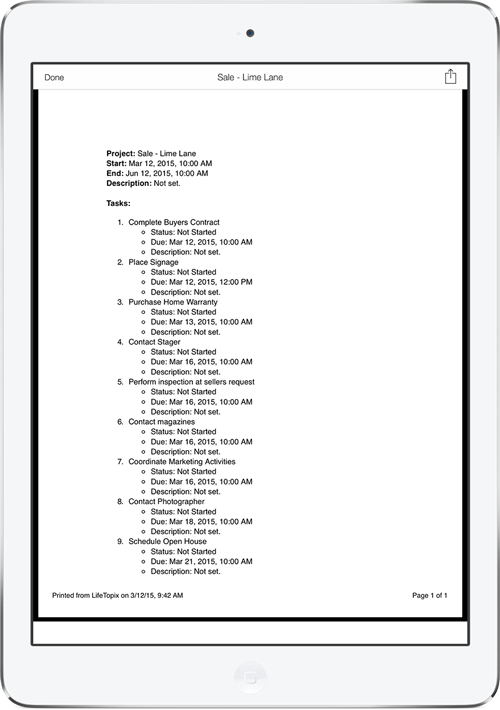 An example of a task list for a real estate agent’s project is shown below. Sometimes, you might want to print out a list of tasks for a project. The best way to print a list of tasks for a project is to follow the steps outlined below. Tap the Tasks + Projects topic. Locate the Projects tile and tap it. 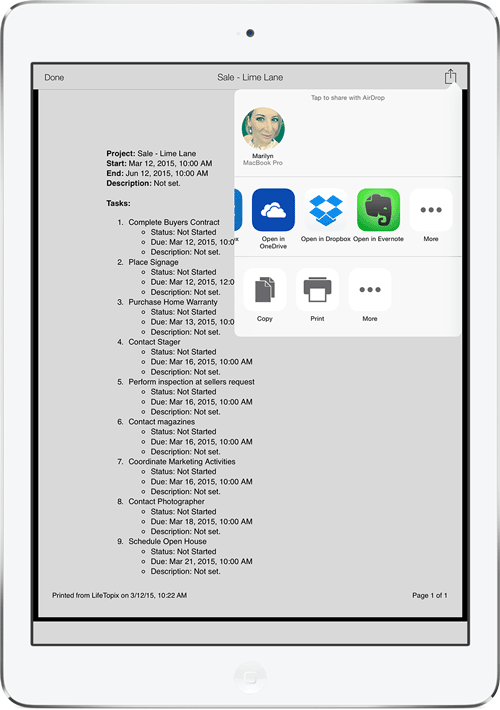 Locate the project that contains the tasks you wish to print and tap it. Tip: Use the Group By filter to help you locate the project if you have many projects. Tap the project to open it. Tap Actions -> Print. Once again, you’re given the option of whether or not you wish to save a PDF to My Documents. An example of the printable task list is shown below. Tapping the icon in the upper-right corner shown in the screen above allows you to share, print or open the task list in a different app. Often times, many users of grocery list apps would like a printable list, but it’s not available from all apps. A printable grocery list comes in handy if you wish to easily give a spouse, family member or coworker a shopping or grocery list. You can generate shopping lists in the Shopping + Gifts topic of LifeTopix. The following image shows a shopping list that was generated for a trip to India. As shown, you can simply tap the Actions button and easily print the list. The list appears as shown below and tapping the icon in the upper-right corner allows you to share, print or open the shopping or grocery list in a different app. The Notes + File, Lists topic in LifeTopix includes powerful note-taking, drawing and note organization features. It also includes features for managing online files from Dropbox™, Google Drive™ and OneDrive™ and syncing online notes from Evernote® and Toodledo. LifeTopix’s built-in and extensive note-taking features include printable notes. An example of a LifeTopix note created by a real estate agent to hold client’s requirements is shown below. 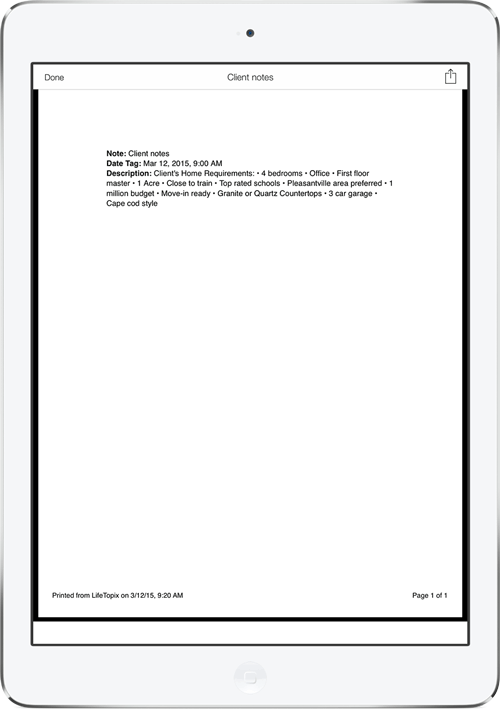 Like other objects in LifeTopix, you are able to easily print a note, as shown above. An example of the printed note is shown in the following image. Tapping the icon in the upper-right corner (below) allows you to share, print or open the note in a different app. When you save your files to the My Documents folder as described previously in this blog post, you might want to access them later in order to associate them with objects in your LightArrow app or for viewing purposes. For example, you might want to associate a checklist with a project. Tap the Notes + Files, Lists topic. Tap Files and then tap the plus sign. Tap Folder and then tap Local Files. Then tap My Documents. A list of your local files is shown. See the image below as an example. Choose View to see the PDF or choose Select to add it to your list of files. In the New File view, tap Save. It is now included in your list of files and you can access it by tapping the File tile in the Notes + Files topic. Now that you’ve added the PDF as a local file, you can associate it with LifeTopix objects (assets, events, goals, notes, projects, etc.) directly from the object itself or from the file as shown below (Associate Topic or Associate Contact). In addition, all files saved in the My Documents folder can be shared via AirDrop, sent via text message, opened in other apps (such as Dropbox, Box, Adobe Reader etc. ), by tapping the icon in the upper-right corner as shown below. In LifeTopix, printing is available in many more views, such as the detailed views of trips, contacts and more. In fact, the LightArrow team is constantly improving the print support. I hope this post gives you a general overview of the printing capabilities of LifeTopix. If you have any questions about LifeTopix or its printing capabilities, feel free to comment on this post below.